A motorist in a busy town somewhere in Algeria refused to take orders from a police officer. 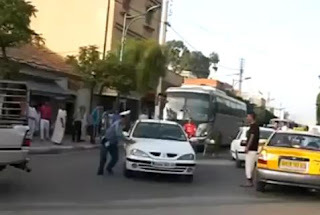 Wanting to get away quickly, the driver (in the first-generation facelifted white Renault Mégane) tries to get around the police officer, who starts chasing by foot before throwing himself onto the bonnet of the car. Even then, the Mégane drive rejected to co-operate and drove-off, taking the police man on a frightening joyride.